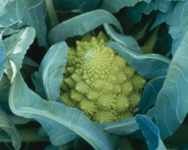 Brassica oleracea; Full sun; plant height: 1-1/2 to 3ft.. Broccoli does best when planted in the early spring or late fall as it prefers cool temperatures. Calabrese - Heirloom from Italy arrived with immigrants in the 1800ft.s. Dozens of side shoots bearing 3-6 heads. Hardy until hard frost. De Cicco - Italian heirloom producing one large central head, followed by several smaller shoots maturing at different times. Long harvest period. Pakman - F-1 HYBRID - The choice of commercial growers for dependability and uniformity. Medium sized heads with many buds are produced in abundance. Does well in spring or fall. Waltham - Large round heads with fine buds. Dependable producer.